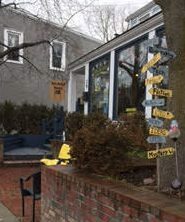 A gem of a bookstore is nestled near the train station in Chappaqua, NY. Cozy couches line the front window just inviting you to curl up with a good book. That is, after you browse the great selection and make your choice, perhaps after listening to some of the recommendations of the shop owner, Laura Scott Schaefer. But the bookshop is not just brimming over with good books. It is also a hub of some great cultural activity. 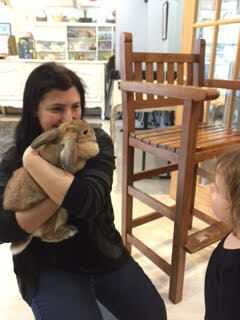 Many events happen weekly at Scattered Books.Today, READING WITH RABBIT, their Tuesday morning toddler read-a-loud program not only featured Acorn, the bunny but also a special guest reader Dr Gina. 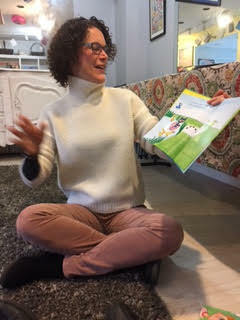 A local dentist practicing in Mount Kisco, Dr Gina appeared and read to the children in honor of Dental Hygiene Awareness Week. Captivating a core audience, Dr. Gina moved from story time to a craft project – while giving the kids a pep talk on good dental habits. The event was free and there were a lot of teeth showing in smiles as the children left with a goody bag of water and a tooth brush! From local artwork to local authors, there is something for everyone in this cozy bookstore. 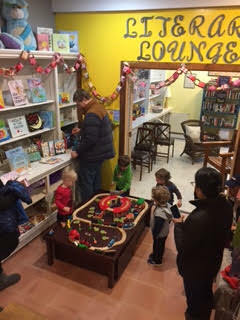 Especially on a rainy February morning, Scattered Books is the place for children of all ages to enjoy some great conversation and find some good reads. copyright: Jane F. Collen IndexCardCure finding local adventures.